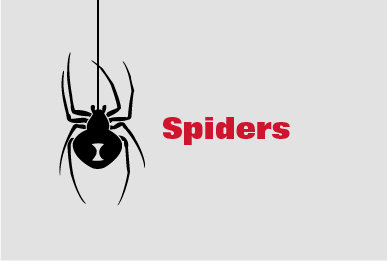 Spider Services – Grand Rapids Pest Control, Inc.
Spiders (and their often mislabeled counterparts, harvestmen) can be annoying pests and can ruin the aesthetics of any residence if left unchecked. Though rare, some spiders can endanger human lives (especially the very young) with the venom in their bite. Two better-known dangerous spiders are the “Brown Recluse Spider” and the “Black Widow Spider.” Most spiders have no intention of harming humans but content themselves ridding the environment of insects, which they use for food. 1. Interior & Exterior Service: spider treatment for the interior and exterior of a residence. This is the complete extermination and prevention of spiders in and around your home. Spiders don’t stand a chance! This service is guaranteed through December 31 the year of service. 2. Exterior-Only Service: a treatment intended to prevent the entry of spiders into a residence. Though this treatment affects the prevention of spider entry more than the elimination of spiders indoors, indoor spiders will be reduced. This treatment is found under GRPC’s “General Pest Category: Exterior Services.” This service is “guaranteed” in the following way: any re-treatments necessary before December 31 are performed at 1/2 cost to you, the customer. 3. Exterior-Only Service: Groups of 20+. This is our “Exterior Spider Treatment” offered at a much-lower rate to groups of 20 or more at one location. This service is a favorite for lake-front neighborhoods. No guarantee is offered with this service due to its already basement-level pricing.